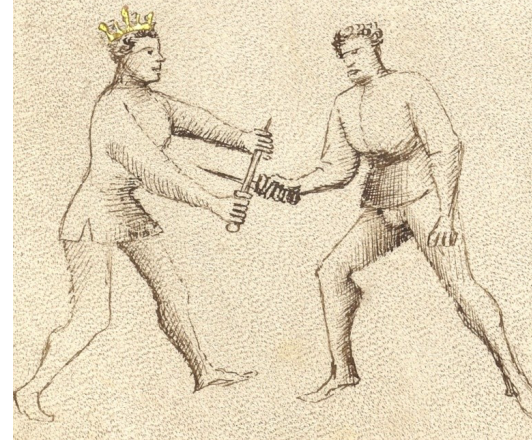 Today we focused on drills 1 & 2 from our article Longsword – Drills for Pflug/Posta Breve/Porta di Ferro. One of the things we noted is that you don’t necessarily want to make the second drill into a single-time counter. If you prematurely commit to the thrust after the wind into Ochs, you become very susceptible to feints. By using two separate actions, with no pause between, you can alter your plans based on your opponent’s actions. If you contrast this with the counter-thrust as a parry, wherein you do want a single-time action, there seems to be a paradox. You can resolve this by counting the movements. In drill 3’s counter-thrust, you are performing one atomic action. In drill 2, you have 3 actions: the parry, the wind, and the thrust. While they should flow one to the next, each action requires that the previous action be complete for it to be effective. For example, if you don’t complete your parry, the cut will find you mid-wind. If you don’t complete the wind, you won’t control his blade and he may dominate yours. In short, double-time actions are constructed differently than single-time actions and you need to perform each differently. We also looked at parrying with the point online. It was demonstrated that if the hilt is low, having the point online causes you to be far too weak to properly intercept the cut. Usually the attack blows right through it, but on occasion it merely ends with a bind that favors the attacker. Illustrations supporting this theory are easy to find. One of the things we’ve come to realize is that the first precept isn’t just another technique. Rather, it is a way to approach the fight with an emphasis on risk reduction. The specific actions in the example device are not important; rather we should be focus on why we’re performing those actions. With that in mind, the goal of the first precept is to control your opponent’s weapon from the onset. The way you do it will vary depending on your opponent’s guard and disposition. So after working with the example itself, we attempted to apply the concept to over guards. When facing someone in Underhut, as shown below, it is just as important to control their weapon as if they were in a high guard. However, the way you do it is different. Our technique is inspired by Fiore’s Eighth Master (shown below). The main difference is that we go for the wrist rather than the blade. Once contact is made, one of two things will happen. If he inclined to leave the dagger against his wrist, push him down with both arms until his hand touches his belly. From there, you can check with the left hand while striking with the right. Make sure there is actual contact between his hand and body, as that’s where he loses his ability to resist. If he is inclined to pull away from the dagger, which is understandable given that it is hard steel and possibly edged, follow him with your left hand on his wrist. As he goes up, apply pressure such that you push his arm behind his head. Once the hand is past the plane of his shoulder, he will lose his ability to resist. When standing in the Cross Guard, your opponent will either have his point forward or his blade against his right arm. Switching between the two takes but an instant, so any attack will need to work for both. For our displacement, we start by crashing the strong of our dagger onto his. This forms a strong bind from which everything else follows. With your blade on his strong, there isn’t anything keeping him from raising his point. When he does so, snake your point behind his blade and over the top of his arm. Next, you grab his blade, hooking your thumb over your own blade, and push your point inwards. If your opponent doesn’t raise his point from his arm, simply grab his arm and blade at the same time. A new term we learned today was “passive vs. active control”. Active control is when you are controlling your opponent in such a matter that requires your full attention and effort. For example, if you catch your opponents wrist as he stabs downward, you are actively controlling him. If you release pressure for even a moment, he can escape or complete the thrust. By contrast, passive control is obtained when your relative positions make resistance all but impossible. In our example against Underhut, putting his hand behind his head is an example of passive control. Once you get there, you can concentrate on your attacks with little risk of him escaping. For the example of the second precept, your opponent starts in a high guard. As he thrusts downwards, you step through to the left, ducking below and past your blade. Keep the arm extended so that you are structurally sound, and if he goes up follow him such that you keep your blade on his arm. We didn’t study the full example today, but rather just focused on the basic mechanics. Today we continued our look at Guardia di Testa. A couple notes that we focused on for this posture. Secondly, watch your hand positions. Both hands need to be shoulder high and between the shoulders with the arms extended. If you do this correctly, your opponent will not be able to throw a point to the underside of your hand. Finally, make sure the point is high. Don’t lower it to your opponent’s face, the reasons for which will discuss below. For these exercises, both fencers start in the same guard. For these cuts, rotate your body away from the blow by throwing your left foot behind the right. Make sure your upper and lower body rotate at the same time and by the same amount. 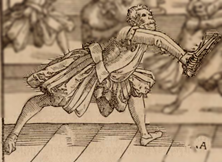 As soon as the parry is complete, strike with the false edge or wind into an Ochs-like posture and thrust downwards. For these cuts, rotate your body away from the blow by moving your left foot further to the left. Again, make sure your upper and lower body rotate at the same time and by the same amount. As before, as soon as the parry is complete, strike with the false edge or wind into an Ochs-like posture and thrust downwards. This is an interesting attack. When using it, your opponent doesn’t strike directly for your head. Rather he aims to strike the strong of your sword with the strong of his. Then using it as a pivot point, he snaps the blow into the head. This is a very effective attack against people who like to parry exclusively with cuts. To counter this, simply thrust into Guardia di Faccia while stepping directly forward. This can be done with either an increasing or passing step. The opponent’s attempt to strike your strong will help guide your point online. WARNING: You can really screw this up if you poorly form your Guardia di Testa. If your point is too low (i.e. at your opponent’s face), he should use the Mandritto Tondo. Even if you try to counter with a thrust, he’ll strike the weak of your sword, knocking it offline. Guardia di Testa 1: Mandritto to the head, flank, or leg. This is one of the first voids that Manciolino teaches us. It assumes that the patient fencer has the right foot forward. As the Mandritto comes in, throw the right foot behind the left so that you are in a Coda Lunga e Alta. As soon as the blade passes outside the silhouette of your body, step forward with a thrust. This will will probably be batted aside, so we are told to follow in the same tempo with a Mandritto. Your left foot will compass behind the right with the cut. When you void the attack, take care to void it completely. This means pulling back your buckler as well so that he isn’t stopped with his sword near the centerline. Ideally he shouldn’t even notice he missed until you’ve started your thrust. Speaking of the thrust, be ready for it. As George Silver would say, you must do it as he is “lying spent”; do not wait for him to prepare his next blow. But if the enemy turns a thrust with a tramazzone you will protect against such a thrust with the sword. And when he turns tramazzoni at you, you will put your sword hand under your buckler, directing the point of your sword toward the enemy’s hand. The trick bit is the point at the enemy’s hand. We tried several variations including a disengage and a Dritto Tramazzone before discovering that all you need to do is pull back the sword hand while relying on you buckler. This entry was posted in Antonio Manciolino, Dagger, Longsword, Meyer's Dagger, Meyer's Longsword, Paulus Hector Mair, Sword and Buckler. Bookmark the permalink. The GdT technique in the video is actually provoke with a thrust (not a mandritto) then a tram. Ugh, I though that I had fixed that title card before I published it. Thanks.